"The holy-days twine themselves together to form the circle of the year. (Franz Rosenzweig)"
Now available - a unique format Jewish Calendar designed by Reb Rachmiel Langer. This calendar shows both the secular (Gregorian) days and the Jewish days, but since Jewish days start at sundown, the days are offset from each other. With this format, it's absolutely clear when the Jewish holidays start. "Eve of" is not indicated anywhere, as it's simply unnecessary. Each holiday is highlighted on the Jewish days during which it occurs, and that automatically includes the evening of the 'preceding' Gregorian day. Each page covers a Gregorian month and shows the Jewish months that occur during that time. The beginning of each Jewish month (Rosh Chodesh) is highlighted, as are Jewish holy-days and Shabbat each week. The weekly Torah portions are identified as well as special Shabbat names. 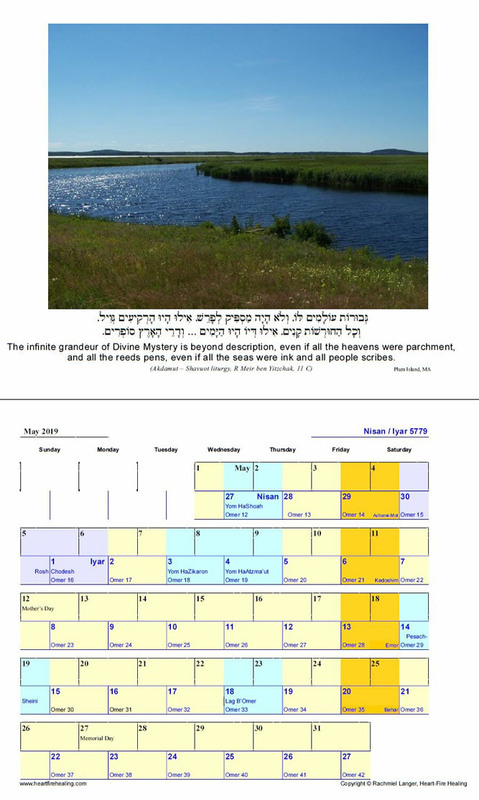 Each month has a beautiful photograph and inspirational quote - often from Torah - that align with the soul cycle, usually through a holiday of the month. The calendar includes a short essay explaining the progression and meaning of the cycle of the holy-days, and a summary of the holiday schedule with definitions. The calendar works for wall-hanging or desk use. Each month opens to two substantial pages (70 lb. white, 11"x17" together), hole-punched for wall-hanging.The colors and photographs are crisp and clear, offset-printed. To order calendars, please send a contribution of $18 each, to support this work Copies of prior year calendars are still available for $7. You can fill out and print this Order Form and send it with a check to the address below. If you'd rather pay by credit card, there will be a 5% charge to cover processing fees. You can fill out the Order Form and attach it to an email or print out the form and mail it in, or you can call 978-952-6034.